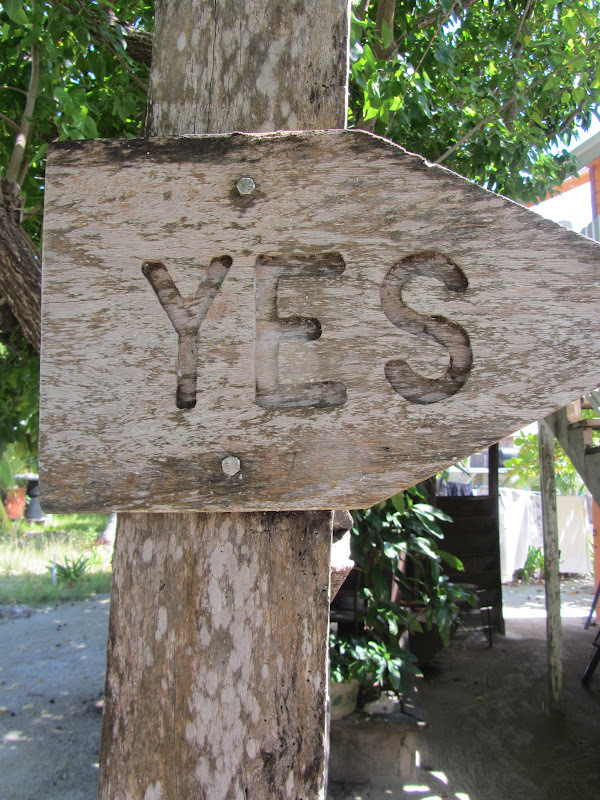 Yesterday I started to describe my Sunday funday on famous St. George’s Caye. The island is such a interesting place…a gorgeous Caribbean weekend getaway for a lucky few that is somehow stuck in time.For a map of the island and some drawings, all you need to do is pick up the Belize $5 bill. We were there for a full day of sailing and speeches, BBQ and beers but I found something very cool on the north side of the island. Actually, someone really cool. His name is Karly. (And I’d actually read about him in this Dallas News article about a year ago: Boy’s Aquarium an Attraction on Belize Coast). 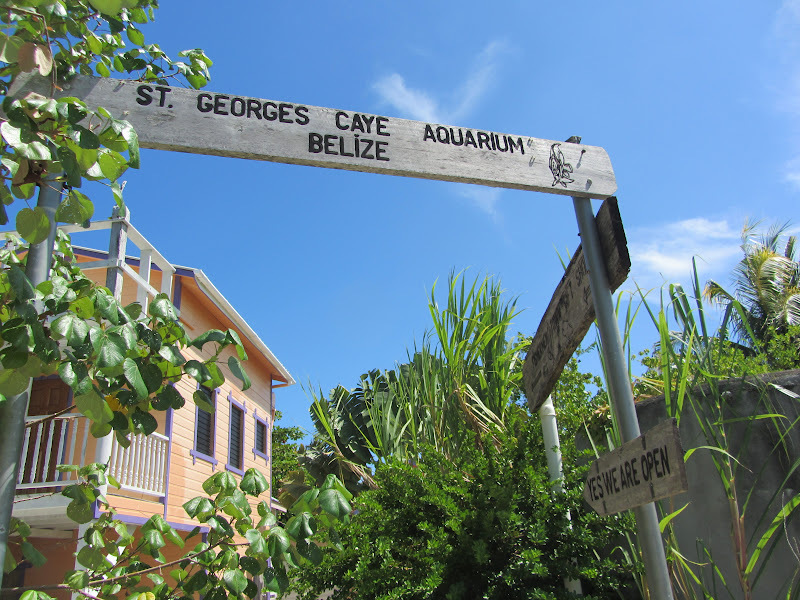 He has lived on St. George’s Caye his entire life, all 11 years of it. 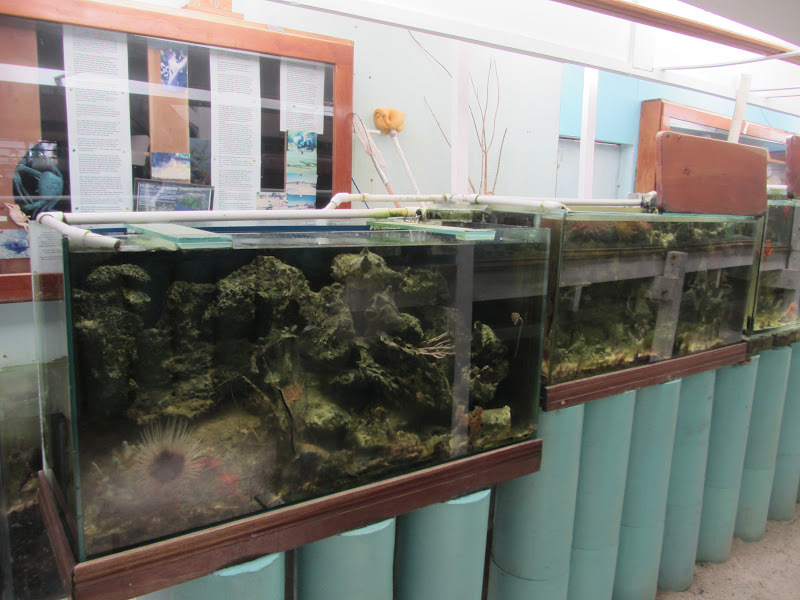 And inside his parents’ boat house, he has built an aquarium, the only aquarium in Belize, and he manages it himself. Karly came down and introduced himself. I think I may have pulled him out of the shower…his hair was wet but still uncombed. He explained that he has lived on the island all of his life. His mother is from Honduras, his father is a marine biologist from Austria and Karly speaks Spanish, English and German fluently. His parents (who he was quick to point out “are not married”) bought land on St. George’s Caye about 30 years ago because of their love for the sea. I can think of few better places to foster that sort of love. A real aquarium. Complete with pictures, information, scientific names and drawings and plenty of sea life. Cool and confident, Karly showed me each and every enclosure and filled me in on the sort of trivia that I love. How do can you tell a male and female spiny lobster apart? Did you know it is the male seahorse that actually carries the babies? He showed me the unattractive toad fish. 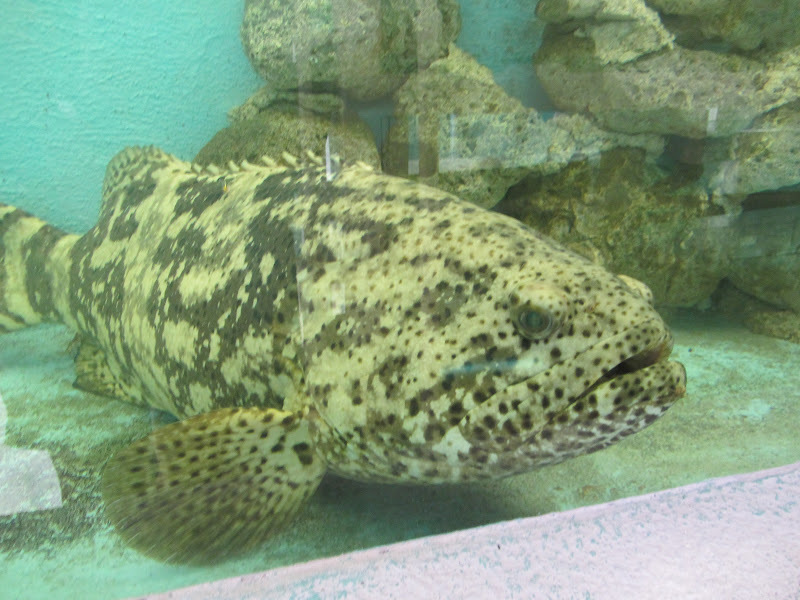 And a Goliath grouper…about the size of my leg. 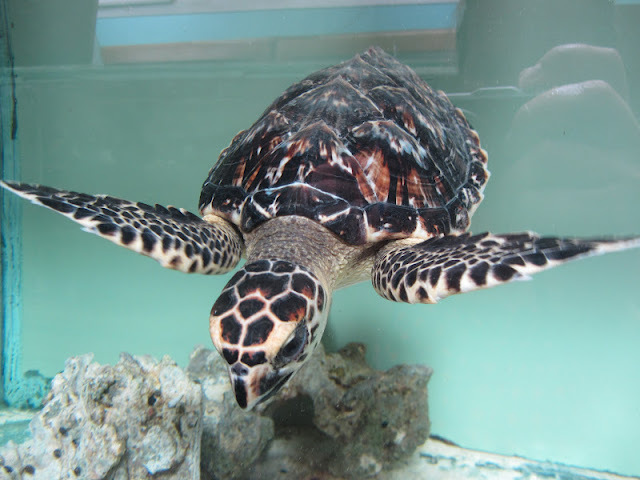 And some very cute hawksbill turtles who seemed to think that human fingers could be lunch. 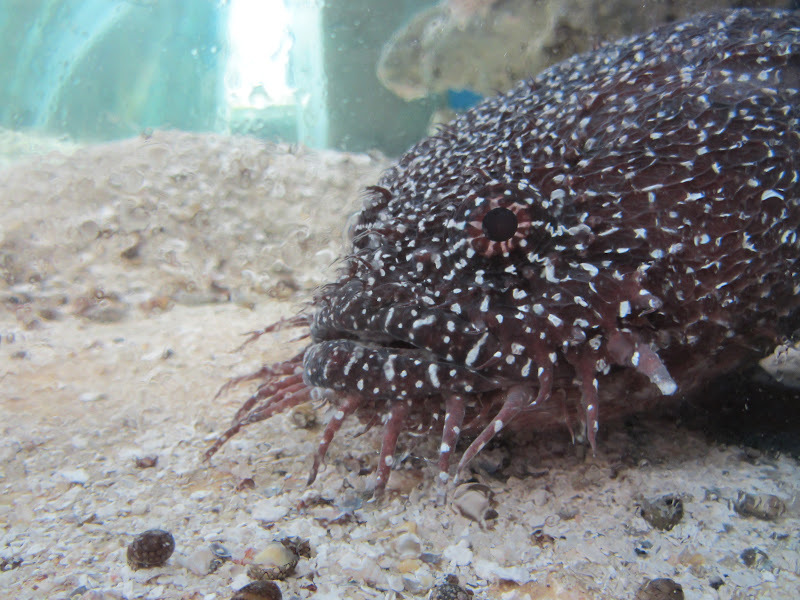 All of the animals (from the fluttering sea anemones to the giant group) are native to the waters of Belize. You can’t stump this kid; he really knows his stuff. From the scientific names to their mating habits. There are no schools on the caye…in fact, according to Karly, there are only 9 full time residents. 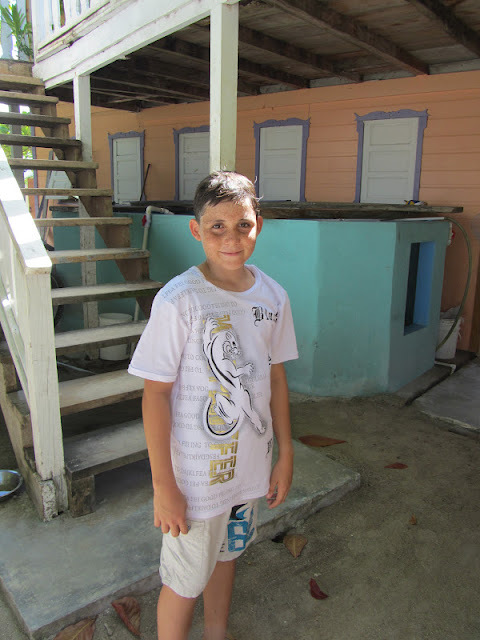 So each day his dad takes him over to Belize City (it’s a 15 minute boat ride) so he can attend school there. I asked him if he ever gets bored living on this tiny island. Nope. Just back from a summer visit to Austria to visit family, Karly says he has his dog, his TV and his aquarium. And that seems to suit him just fine. Keep an eye on Karl in the future…I know he’s going to do some pretty special things. And, to let you know if you didn’t see it on my Facebook page, I am headed to Medellin, Colombia tomorrow! (Cancun to Panama City to Medellin.) Yes…THAT Medellin. Home of now deceased Pablo Escobar and formerly considered the most dangerous city on earth, Colombia is now a huge tourism hot spot.